Question: How could Thomas Jefferson have anticipated the Obama Administration? Answer: He knew all about an over-reaching central government. “Was the government to prescribe to us our medicine and diet, our bodies would be in such keeping as our souls are now." Have there been or are there any modern day American political figures who agrees with Jefferson? "You betcha." 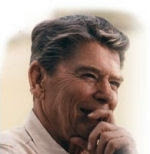 No wonder the liberal, progressive, socialists hated Ronald Reagan and hate Sarah Palin. Tags: Obama administration, Ronald Reagan, Sarah Palin, Thomas Jefferson To share or post to your site, click on "Post Link". Please mention / link to the ARRA News Service. Thanks!